Get the engine in, get the AFR's checked. 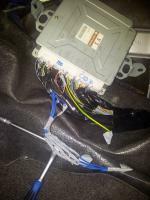 Where do those blue wires from the ECU lead to? There's something plugged in there which isn't OE.